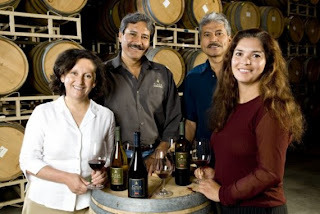 During this week of Cinco de Mayo celebrations my thoughts turned to family-owned Ceja Vineyards, One of the nation's first wineries founded by Mexican-Americans, Ceja has a winery in Sonoma and a popular wine-tasting/art gallery/salsa dancing bar in downtown Napa. Everyone in the family seems to play a big role in the company, which is headed by Amelia Moran Ceja. The first Mexican-American woman to lead a U. S. winery, she was named Woman of the Year in 2005 by the California Legislature for her contributions to the state’s wine industry. So at this Cinco-de-Mayo time of the year I decided to get a bit of culinary inspiration from Amelia Ceja herself. That's easy to do since a large part of the winery's website has long been given over to multi-cultural recipes and an extensive collection of "how to" video demonstrations starring Amelia and other family members. Now Ceja is going a step or two further by constructing Salud! Napa, a "bicultural cooking show that embraces world cuisine, wine and the arts." It looks to be informative, delicious---and fun. You can catch a glimpse of what awaits when the site is finished by going here. Preheat the oven to 375 degrees. To prepare the rotisserie chicken pull the white and dark meat off the bone in bite size pieces leaving the skin off. In a bowl mix the chicken, arugula, cranberries (leaving a few for garnish) and parmesan cheese. Slice one side of the pasilla peppers and stuff with the chicken mixture. Place on a baking sheet and bake for 20 minutes at 375 degrees. While the peppers are baking you can now prepare the simple yet tasty cilantro sauce. In a blender or food processor puree the washed cilantro, toasted pumpkin seeds (leaving a few for garnish), crème fraiche and salt and pepper. If the sauce is thick, just add a touch of water to thin it out. Keep the sauce at room temperature until the stuffed peppers are done. 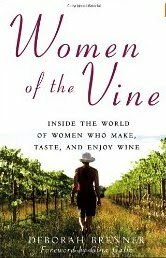 Amelia Ceja is one of 21 wine-industry women interviewed in this book, which covers everything from the crush to the shoes to the perfect pregnancy timetable when working among the grapes. Besides the glory and success, there's plenty of angst and adversity (disappearing funds, gender discrimination, and family).